This week’s Friday Field Foto is from the Death Valley region in California and shows a very nice debris flow deposit (note the hand in the lower right of photo for scale). 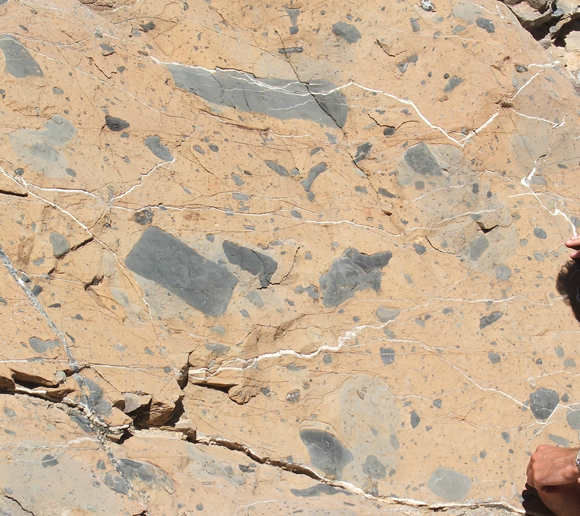 This is from the Permian section in a location called Darwin Canyon (I forgot the name of the formation). I would include “angular clasts” with those characteristics. That’s some gorgeous stuff. Yes, that’s a good point, the clasts in debris flow deposits are commonly angular or sub-angular … however, I’ve seen some debris flow deposits that don’t have angular clasts (especially in submarine examples) yet they still would be classified as a debris flow deposit from a process point of view. Ron … not sure, that name doesn’t sound familiar … and it sure seems like a name I’d remember! So what is the difference between that and a diamictite? LL … yes, good point … from a purely objective/descriptive point of view these deposits could be termed diamictites. I don’t use that term very often … when I’m logging a section and describing I will capture the specific features I mentioned above in my notes. I’ll describe the sizes and shapes of clasts, their composition, the grain size of the matrix, contact relationships with overlying and underlying strata, and so on and so forth. For detailed sedimentological studies simply saying ‘diamictite’ in my notes wouldn’t be very helpful later. So, I think it depends on the scope and resolution of the study. But I’m typically looking at tectonically ‘intact’ successions with a good deal of context w/r/t general depositional setting (e.g., already know if the succession is marine, glacial, volcanic, etc. in origin). If I were trying to characterize strata in a relatively unknown/unmapped succession and/or within tectonically dismembered units and didn’t want to get too bogged down in sedimentological minutia then I suppose I might use ‘diamictite’. If I were a structural geologist interested in post-depositional deformation features and not interpreting depositional environments of a formation then a term like ‘diamictite’ might suffice. But this is just me and a function of my experience … I’m sure others have differing perspective. I’m just a student, so I get a free pass if these are stupid questions, so…. You mention that debris flows can be submarine. Is this particular debris flow submarine? If so, what criteria can be used either in the field or in the laboratory to determine that? Also, if it is submarine, is it possible that this particular debris flow is genetically related to either of the two turbidites that you say bound it? Jeremy … ask all the questions you want. I may not have all the answers, but I’ll try. You bring up a very good point. It can be quite difficult sometimes to know for sure if a debris flow deposit is submarine or not. In the field, the first thing to consider is stratigraphic context … and what I mean by that is what type of sedimentary deposits are above and below? For example, let’s say you are mapping and come across a bed that you interpret as a debris flow deposit — and this bed is encased within a thick, conformable sequence of nonmarine and alluvial fan deposits. It would be unlikely (although I suppose not impossible) that there was just one deposit of marine origin in there. But, like the case here, if the bed was within a thick package of marine sediments then it’s more likely it has a marine origin. So, that’s what I mean by stratigraphic context. But you could also take sameples and analyze the muddy matrix material. Depending on the geologic age, basin setting, and so forth, marine muds will commonly have microfossils/nanofossils that reflect it’s marine origin. As for you last question … I don’t remember exactly what this example looked like, but, yes, there are examples where people have interpreted a process relationship between stratigraphically adjacent turbidites and debris flow deposits. There was a special volume in Marine & Petrl Geol this summer about such beds, termed ‘co-genetic beds’. Thanks a lot Brian. I really appreciate you taking the time to answer my questions. I was wondering if I could persuade you to list some reasons why you don’t think this is an injectite. I can think of a few possibilities , but I’m really no expert . . . . and I know you are. Eric … good question … after seeing your comment I looked through my other photographs from this outcrop to see if I had a shot that showed the relationship of this deposit to the underlying and overlying stratigraphy. Unfortunately, I do not have such a shot. But, if my memory serves me well, the key factor that leads me to interpret this as ‘normal’ depositional feature (i.e., not a post-depositional remobilization feature like an injectite) is its relationship within the succession. In this case, this deposit is conformable within the package. All the injectites I’ve seen in outcrop can be seen cross-cutting other strata. There are some cases where a bedding-parallel injectite (essentially a sedimentary ‘sill’) can really trick the observer because it doesn’t cut across strata and can look like a bed. But even in those examples the body is very undulating. In terms of internal characteristics, both debris flow deposits and injectites can be quite chaotic and disorganized. A lot of the sandy injectites I’ve seen have a ‘ropey’ texture to them, but that’s just a descriptive observation, I haven’t studied their textures in any detail. The other thought that comes to mind is the mud content of the matrix in this deposit. I’m not sure what the mud content is like in documented injectites … they are typically pretty sandy though. That’s all off the top of my head … feel free to comment with some other ideas if you’d like. Thanks for the good response, Brian. Ah, I could wish for a field trip in sunny California while I am stuck here in rainy cold Alaska. Speaking of ropy injectites, the Yellow Bank Creek injectite near Santa Cruz (Ch 13 of Mem. 87) is surely spectacular–worth a field trip if you haven’t seen it. I am intrigued with injectites and especially conglomeratic injectites. These are a whole new category of rocks with their own set of characteristics and considerations–and fast developing science. Rhetorically, I ask myself, where do breccias end and injectites begin, or how do mud volcanos relate. The list could go on . . .